Big beer, big music, big maths, big crowds. This then as then beer that is; 8% ABV, 120 IBU things, 240 calories a serve, and for the 500ml bottle that would be 3.16 standard drink units. 120 IBU is bonkers. 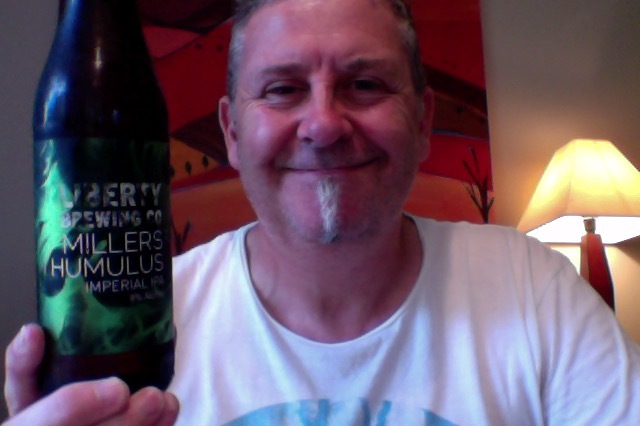 Brewed by Liberty Brewing Co in the style that is Imperial/Double IPA and they are in Auckland, New Zealand, the people that brew the amazing C!tra. Of course. Brewed with 100% imported USA Malt, Hops and Yeast, this beer claims to have the largest carbon footprint in New Zealand. M!llers IPA has now been brewed to commemorate the success gained by Neil Miller: New Zealand’s champion Beer Writer. Enjoy the taste of enamel being stripped from your teeth at refrigeration temperature with your friends and family. Of course a burst of green grass hop aroma on opening, what else were there to expect? But it’s also nice a sweet too. On the tongue this is a monster bitter punch, but then you knew that was coming? Despite that though there isn’t a flinch with it or a gasp. The finish, again no surprises, is dry, going on arid. The aroma is still big, and I also get something else, not all pleasant, but present, like a burnt plastic, faint but for me there, if I give it a really good snort, but that’s not the thing you normally do is it. Who knows we’re all different. So I imbibe some more, and revel in the lovely way that the bitterness rolls across the tongue in an orderly fashion, the bitter then the sweeter mellow middle and the tang at the back, all preceded by the grassy aroma. Thing I noticed too is that you’re compelled to the next mouthful, it is really inviting, and alarmingly easy drinking, and then you notice that the most of the beer has gone, and you’ve been all poetic and wistful about it. Is it a good beer? Yes it’s a good beer, it is balanced, has a few flavours that unwrap and develop, and isn’t monitoring the palate and making you regret it, you could switch from this to another beer and still enjoy the other beer despite the assault. For me though, it’s not the be all and end all of IPA’s. An undefinable thing, again I think we’re all different, I might have like more middle in this perhaps. And here I am, empty glass, wondering how that happened, and wishing I had another. It is one of those beers. The pdubyah-o-meter rates this on it’s scale of things as a 9 of its things from the thing. only a 9? are you mad, are you missing something, you said….. I know I said, but I don’t think that ‘everyone’ would feel the same about this as i do. I’d like more malt in this, although this has a drooling about of bitterness that sometimes you just need a hit of. I think that because I can’t stretch to enjoying the middle as much as the hop punch up front and arid finish that I could put this ‘on the list’. Call me you have one and want to share, or know of an ‘on tap’ experience, I’ll be there. Am I enjoying it? This is a thunderously good hop heavy beer of some class. Would I have another? I am bemoaning that I don’t have another, it’s just not right. Would I share with a friend on a porch and set the world to rights? I might let you hold the bottle, or read the label, I’m not sure I’d share this. Of course I’d share with you and show you the light, the way and the goodness, it’d be a sin not to preach about this on the porch. Honest. Music appreciation this afternoon extended to Angus & Julia Stone who are an Australian brother-sister folk and indie pop group that formed in 2006 by Angus Stone and Julia Stone. 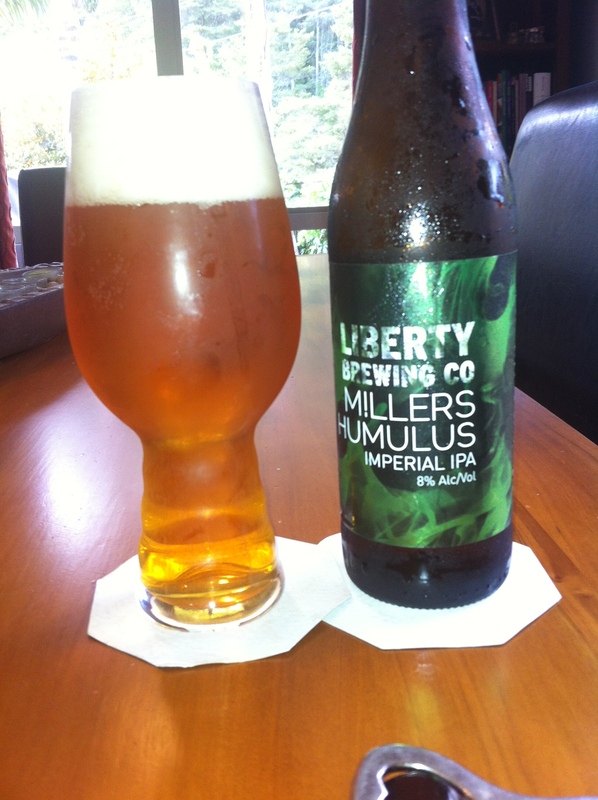 This entry was posted on March 8, 2015 by Philip Walter in Beer, Beer of New Zealand, Beer Review, Craft Beer, Critic, Imperial/Double IPA, Liberty Brewing and tagged Alcohol by volume, Beer, craft beer, Liberty Brewing, Liberty Brewing - M!llers Humulus, Liberty Brewing Millers Humulus, M!llers Humulus, Millers Humulus.